Sarah Marie walks back to her bike after a successful caribou hunt. Few places are as beautiful as Interior Alaska in the fall. Dwarf willows turn red and yellow, berries fall off bushes into your hands or bucket, and glaciated peaks receive their first blanket of new snow. The air is crisp — immaculate even — and on it the fragrance of Labrador, cranberry, and a potpourri of lichens and tundra. Fall is the season for harvesting. The colors, aroma and frosty mornings ring the ancient alarm clock within and inspire action. I spent three days this fall camping in a valley off the Denali Highway with 20 friends. Our mission was to hunt caribou by human-power in one of the few road-accessible, non-motorized hunting units in Southcentral Alaska. I joined the hunt to participate but also to make a film. For the last several years, my friend and fellow lifelong Alaskan, Birch Block, has taken it upon himself to organize these hunts and help facilitate a collective hunting experience for people of mixed know-how and backgrounds. Anchorage’s Off the Chain bicycle collective has become the focal point where these hunting trips take seed and germinate into reality. In lieu of motors, many hands help distribute the workload, and meat from these communal hunts is shared, based on degree of individual input: one share for having a tag and dispatching an animal, one for hauling, and one share for every 10 hours of butchering/processing. Before the hunt, I met with my friend Maligiaq Padilla, who grew up in Greenland and moved to Alaska to help revitalize traditional kayaking throughout the state. I wanted to interview him about human-powered hunting in his native country and discover some of the differences in game management. Game management is a politically complex subject. It’s fair to say we have an abundance of large game ungulates here in Alaska. Most residents and visitors alike appreciate and value this aspect of our unique state. However, I believe it is also fair to say that with the advent of bush planes, ATVs and other motorized vehicles, pressure on wildlife is greater than ever. In the face of all this mounting pressure, predators have become the go-to scapegoats and seem to take the bulk of the blame when herd numbers are in decline. In the complex amalgam of wildlife management decisions, the means and methods by which we hunt are rarely considered. Especially as the 21st century grows more intensive — the population, demand on resources, technology and access to motorized equipment — controlled-use (non-motorized) hunting areas could be a an important management tool to limit impacts and create a better hunting experience. Brian Schuch prepares to leave camp for the day in pursuit of caribou. 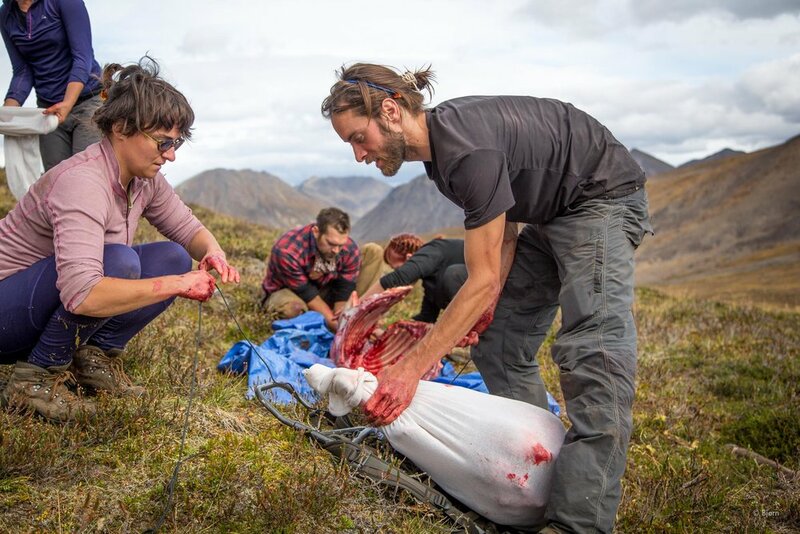 As I stashed my bike and began hiking up toward Sarah and her fallen caribou, I wondered if Alaska could learn something about game management from Greenland. I felt the squish of low-bush currents underfoot and absorbed the deafening silence of the valley. We were in rich habitat, mostly undisturbed by motors. Our hunting party was having great success. Reverence for the eleven animals’ lives we took was palpable on this hunt, and evening conversations over the campfire often centered on this topic. The majority of our group didn’t actually shoot and those that did, did so with a complete absence of grandstanding. Connecting and fully participating in our food is spellbinding, whether it is growing a garden, raising livestock, picking berries, hunting, or dip netting salmon, the result is the same. No meal ever tastes as good as one you’ve participated in from the beginning. Eating store-bought beef or lamb comes with an incredible carbon footprint and for this reason; I am often a vegetarian when I don’t have access to wild game or fish. For every quarter pound of beef, four pounds of greenhouse gasses are created. Beef is the second highest greenhouse gas food source, after lamb, and eating 2.2 pounds of lamb is equivalent to driving about 90 miles. All food comes with a carbon footprint, especially in Alaska where most of it is imported. Harvesting wild foods is one of the most defining attributes of Alaska culture. It may also be one of our most environmentally responsible practices, too. The hunting collective stands for a group photo. “You can’t spell meat without team,” someone said during the blurry-eyed, second night of butchering back in Anchorage. In the coming winter I and many others will eat meat filled with nutrition, meat filled with memories, and meat full of gratitude, community and resiliency. We have a long way to go toward solving climate change or any other resource and sustainability issues facing Alaska. Human-powered hunting, though, with a big group of inspiring friends, feels like a good step in the right direction. Bjørn Olson was born in an abandoned trapping cabin in which his family squatted in the Copper River Valley, near Mentasta Village. He is an adventure filmmaker, photographer and storyteller who lives in Homer. This article originally ran in the Fairbanks News Miner. A film about this hunt is in the works.